Martin Luther King Jr. was a well known social activist and Baptist minister who led the Civil Rights Movement in the United States during the mid-1950’s until up to his assassination in 1968. Here are 10 facts about Martin Luther King Jr.
Born as Michael King Jr. on January 15, 1929, in Atlanta, Georgia, King Jr. had a revolutionary impact on the race relations in the United States, which began during the mid-1950’s. He played a pivotal and important role in ending the legal segregation of African-America citizens, as well the commencement of the Civil Rights Act of 1964 and the Voting Rights Act of 1965. Martin Luther King Jr. was born as a middle child to Michael King Sr. and Alberta Williams King. His grandfather, A.D. Williams was a rural minister for years and then moved to Atlanta in 1893. King Jr.’s grandfather became a pastor of a small Baptist church and had his son King Sr. follow his legacy. King Sr. soon became a successful minister and adopted the name Martin Luther King Sr. in honor of a German Protestant leader, Martin Luther. In time, Michael Jr. followed his father’s footsteps and adopted the name himself, thus becoming Martin Luther King Jr. as the world would remember. Martin Jr. had an older sister named Willie Christine and a younger brother named Alfred Daniel Williams King. Even with utmost efforts, Martin Jr.’s parents couldn’t shield them from racism. HIs father, King Sr. fought against racial prejudice because he considered racism as an affront to God’s will. This mindset left a lasting impression on Martin Jr.
One of the most significant moments of Martin Jr.’s life was when he jumped out from a second story window, attempting suicide. This was due to the death of his beloved grandmother, Jennie, whom Martin loved dearly and her death were an extremely traumatic time for him. Martin Jr. attended Booker T. Washington High School, where he was said to be a rather precocious young man. He entered Morehouse College at the age of 15, in 1944. Although popular, Martin Jr. was unmotivated as a student. Even though his family was deeply rooted in church and worship, Martin Jr. was always a little uncomfortable with the religious ideas and concepts. However, he took a Bible class which helped renew his faith and thus he began to envision a career in the ministry. Although excelling in his educational endeavors, Martin Jr. also rebelled against his father’s conservative upbringing by drinking beer and becoming involved with a white woman during his college days. He earned a sociology degree, got elected as student body president and was also the valedictorian of his class in 1951. During his last year in seminary, Martin Jr. came under the guidance and influence of Morehouse College President, Benjamin E. Mays who played a significant role in the spiritual development of Martin Jr. The Montgomery Bus Boycott incident became a turning point in Martin Jr.’s career. On December 1, 1955, the NAACP (National Association for the Advancement of Colored People) got the opportunity to make a case against one, 42 year old Rosa Parks who was seated in the ‘colored’ section of the bus, where she refused to give up her seat to the white man on the Cleveland Avenue Bus. She was later arrested and booked for violating the Montgomery City Code. After a 30-minute hearing, Parks was found guilty and fined $10 with an assessed $4 court fee. On the night that Rosa Parks was arrested, E.D. Nixon who was the head of the local NAACP met with Martin Jr. and other civil rights leaders in order to plan a citywide bus boycott. King was elected to lead the boycott as he was young, well educated and had a sound professional standing. Initial, small victories for the African-American civil rights leaders, gave hope to Martin Jr. and several other movements, rallies and gatherings were carried out, in order to fight for equal rights for the African-American citizens of the United States. Inspired by Gandhi’s success with non-violent activism, Martin Jr. visited Gandhi’s birthplace in India. The trip affected him deeply which in turn increased his commitment to the civil right’s struggle. In 1960, a group of African-American students began a movement named “Sit-In” which gained immense popularity within a short period of time. If asked to leave, these students would simply stay put at where they were seated, which then in turn often brought them verbal as well as physical abuse. On August 28, 1963, Martin Luther King Jr. addressed the nation with his speech “I Have A Dream” in which is emphasized his hope and belief that someday all men would be treated as equals and brothers. This speech was made during an organized demonstration in downtown Birmingham, Alabama. 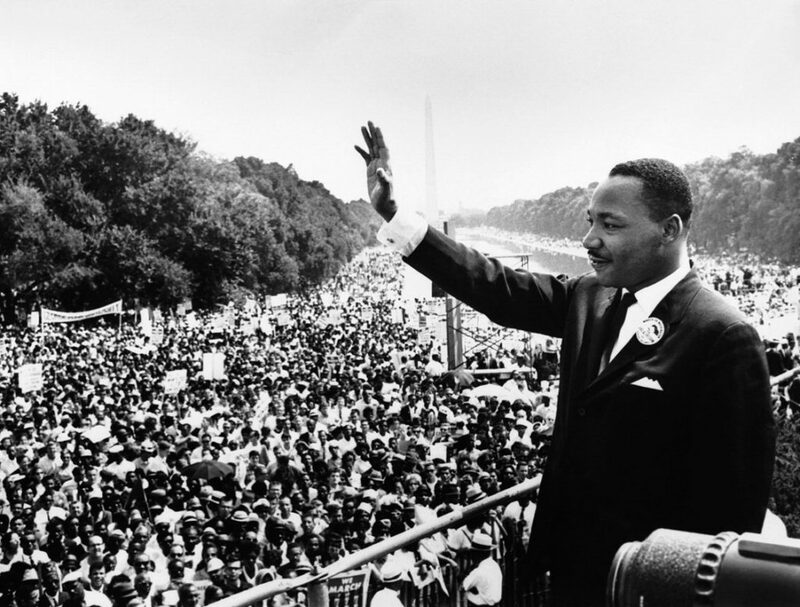 Although criticized for his actions, for his beliefs, Martin Jr. never gave up hope and continued to fight for the equal rights of the African-American citizens of the United States, making him one of the most beloved and influential leaders that this world has seen.